The breakfast buffet event is scheduled for 8 a.m. until noon, Saturday, April 15, 2017, at the Delavan United Methodist Church, 213 S. Second St., Delavan. The menu includes scrambled eggs, sausage, pancakes, biscuits and gravy, juice, milk and coffee. You don’t have to be Irish to celebrate St. Patrick’s Day. 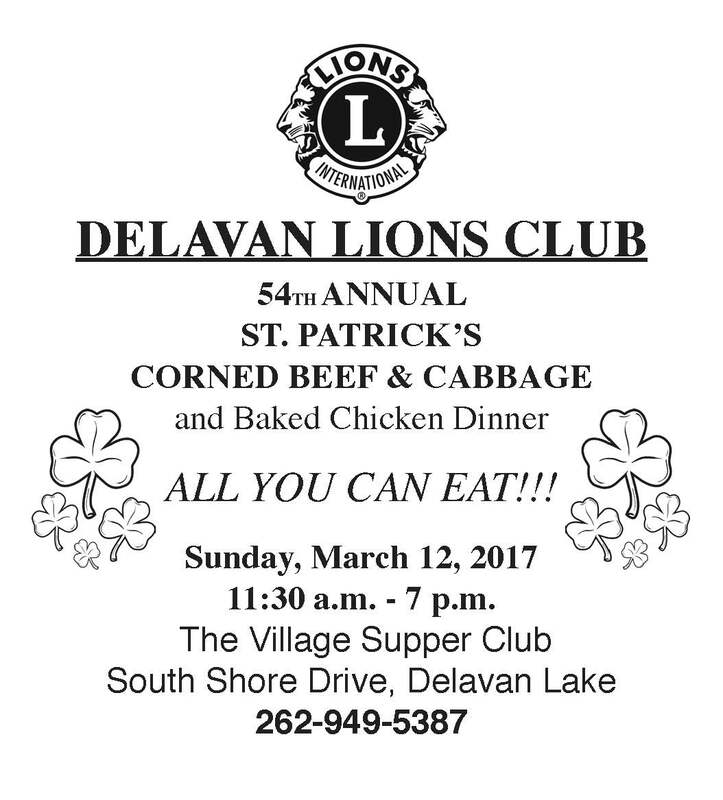 The Delavan Lion’s Club will once again be serving corned beef and cabbage with all the fixins at its 54th annual St. Patrick’s celebration from 11:30 a.m. to 7 p.m. Sunday, March 12, at the Village Supper Club, 1725 South Shore Dr. on Delavan Lake. Cost for adults is $12 at the door, or $11 in advance available from any Delavan Lions Club member, or at Stinebrink’s Piggly Wiggly, Bradley’s Department Store or at the Village Supper Club. Cost is $6 for children 6 to 12 while those 5 and under eat for free. Ticket charges include coffee or milk and all of the trimmings — succulent corned beef, sweetly steamed cabbage, baked chicken, Irish potatoes, carrots, horseradish, fresh rye bread and butter. Also, there will be an hourly 50/50 raffle for cash prizes. Proceeds from this and other Delavan Lions fundraising events go to various charities and other good causes within the Delavan community, and to the Wisconsin Lions Camp in Rosholt, Wis. The camp offers a quality camping experience for eligible children and adults who are blind or visually impaired, those who are deaf or hard-of-hearing, and those with diabetes or educational autism, etc. A chance remark – “Blind kids can’t go to outdoor camps and stuff like that…” – started it all in 1955. The following year, Lions Clubs in the State of Wisconsin founded the Wisconsin Lions Camp and the Wisconsin Lions Foundation, Inc. to administer the Camp program. From that humble beginning when it served 26 campers, your Wisconsin Lions Camp now serves more than 1,300 campers each summer. For more information about the dinner event, or advance tickets, call 262-949-5387. Save the date for the Delavan Lions Club’s 54th Annual Corned Beef & Cabbage Dinner! Sunday, March 12 at the Village Supper Club on Delavan Lake. 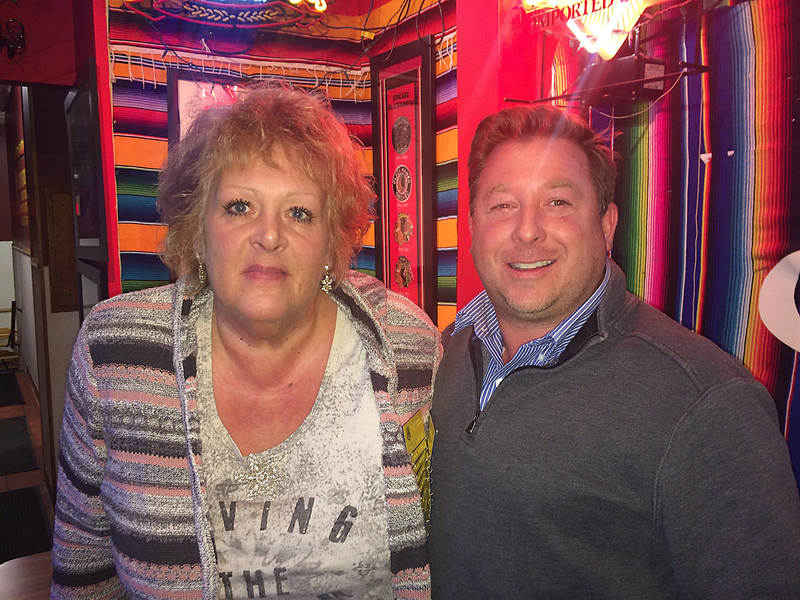 At its December 2016 meeting, the Delavan Lions Club celebrated the service anniversaries for Lion Deb Schwann, 10 years, and Lion Ryan Schroeder, 20 years. The club itself has been serving the Delavan community and raising funds for worthy causes since 1938. The Delavan Lions Club Breakfast with the Easter Bunny event on Saturday, March 26, was a huge success, raising approximately $2,200 for Walworth County Special Olympics team. Special Olympics Team members helped out with the event, serving food, bussing tables and making some of our delicious pancakes. A special thanks to the many business and individuals that donated food, supplies and items for the raffle drawings, which were a huge hit. Many also bought “family sponsorships, ” where a $25 donation bought a family four-pack of tickets. Those tickets were distributed to families and children in financial need in cooperation with the Delavan-Darien School District. The breakfast buffet event is scheduled for 8 a.m. until noon, Saturday, March 26, 2016, at our new location, the Delavan United Methodist Church, 213 S. Second St., Delavan. That’s right across the street from Phoenix Park in Delavan, so kids and their parents can come over after the city’s Easter Egg Hunt in the park. Raffle prizes will also be available, including an autographed and certified 2015 Packers football, Snappers baseball tickets, wine tasting certificates from Staller Winery and Studio Winery, tickets for the Lakeland Players, a month membership for Four Lakes Athletic Club, two season passes to the County Fair, Wishing Well floral arrangement, and gift certificates to Sorg’s, Annies Burger Town, Korey’s Auto Care, Brick Street Market, Tubby’s Too, Young Auditorium tickets, Sentry Foods floral arrangement, two Music By the Lake tickets! Come join us for a great dinner on beautiful Delavan Lake! The Delavan Lions Club’s 53rd annual, all-you-can-eat corned beef and cabbage and baked chicken dinner is set for Sunday, March 13, 2016, at the Village Supper Club on Delavan Lake. It includes coffee or milk and all of the trimmings — succulent corned beef, sweetly steamed cabbage, baked chicken, Irish potatoes, carrots, horseradish, fresh rye bread and butter. Also, there will be an hourly 50/50 raffle for cash prizes. Advance tickets for this St. Patrick’s treat are $11 and are available from any Delavan Lions Club member or from these Delavan locations: Village Supper Club, Stinebrink’s Piggly Wiggly, Bradley’s Department Store or Hunter’s Service. You may buy them at the event for $12. Cost for kids age 6-12 is $6. Kids 5 and under eat free. The buffet dinner is available from 11:30 a.m. until 7 p.m.
For more information or advance tickets, call 262-949-5387. The Village Supper Club is located at 1725 South Shore Drive on beautiful Delavan Lake. Seventh graders in the Phoenix Middle School Family and Consumer Education courses taught by Ms. Terri Brown sewed pillow cases for children needing long-term hospital stays. The Delavan Lions Club made a $200 donation for materials for the project, which will support the organization Ryan’s Case for Smiles (formerly ConKerr Cancer). The organization works to improve the quality of life of children and their families as they undergo treatment. The cases brighten up the hospital rooms and help reduce the trauma and stress kids can experience while undergoing lengthy treatments. Way to go sewers! We are #DDCometProud of you for completing this project for the fourth year in a row!